The original shareholders and company officers were Edward N. McNabb as president, Charles R. Piggins of 1100 W. Sixth St, Racine, and Frederick H. Piggins of 714 Racine Street. It is not known how the shareholding was divided among the three men. Charles Piggins produced the first annual report alone. The addresses indicate that both brothers lived within a block's distance of their workplace. McNabb cannot be identified but one might well suppose that he could have been a financier or dealier, or perhaps simply the brothers' attorney or accountant. 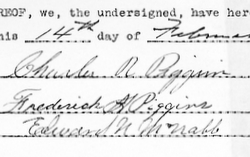 No details are available on the size of the Piggins Motor Truck workforce, because inspections and statistics are not available from 1912 onwards, when the Industrial Commission of Wisconsin succeeded the Bureau of Labor and Industrial Statistics. 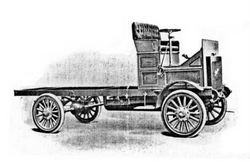 Kimes (a book which must have based a considerable part of its findings on old advertisements) claims the Piggins brothers described their truck as "The Practical Piggins" and produced the series until 1916. Advertising had shown a marine version of the Piggins engine still on sale in 1915. Nothing is known about why or when the Piggins company declined, although some kind of successor seems to have had a paper existence in 1917 when the US Congress took a roll-call of businesses as it considered how to raise funds to fight the First World War (see Notes). The war would have provided an enormous opportunity for the company, given that Piggins Bros. would have been able to ship trucks from the port of Racine. According to The Story of the Automobile: Its History and Development from 1760 to 1917 (BARBER, Herbert Lee; Chicago, A.J. Munson & Co., 1917) war orders in 1914-15 (from the European powers) for trucks rose to 14,000 as compared with only 784 in the season 1913-14. "The war has been a great blessing to the motor truck feature of the industry," observed Barber, writing before the United States entered the war in April 1917. The US Army was soon to purchase trucks from 294 different manufacturers to send with the American Expeditionary Forces (AEF) to France and US manufacturers stepped up output, producing an astonishing 227,000 trucks in 1918, according to William Scheck [World War I: American Expeditionary Forces Get Motorized Transportation, Military History, June 1997. Perhaps someone could also check Cole, Howard J, History of the Engineer Motor Transport Service (Engineers Library, Fort Belvoir VA)]. Piggins Truck may well have been handicapped by a lack of capital. Kimes states that the Piggins make was "superseded" by the Reliance, which was continued in manufacture in Racine and Appleton into the mid-1920s. Albert MROZ, in The illustrated encyclopedia of American trucks and commercial vehicles, from the same Wisconsin publisher and using the same information store (Iola, Krause Publications, 1996), states that the "company evolved into the Reliance Motor Truck Co. in 1917 and moved to Appleton." Contemporary reports indicate Reliance began in Racine with four times the capitalization of Piggins and then doubled its nominal capital to 1 million dollars for the move to Appleton. Neither book fully explains this association, though a look at advertisements in 1919 for the 1½-2½-ton Reliance light truck show a mechanical similarity to the patented axle of the Piggins trucks. Alain-Claude Mainguet states that Reliance Motor Truck operated at Appleton, Wisconsin from 1917 to 1927 and should not be confused with a similarly named company which operated at Owosso, Michigan 1906-1911 till becoming part of General Motors. 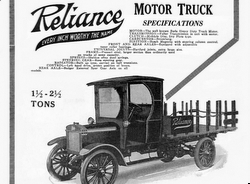 Another 1919 Reliance advertisement in the Motor Age stated that the Reliance truck had been built for 10 years, that is, from 1909 onwards. It is possible that this claim refers to the Piggins Brothers era, although there is no proof of this. After these two ambitious but unsuccessful ventures, Charles Piggins' later patents suggest his attention then moved on, first to components (a baton-type electric indicator with lamp, one of the first of the type that was common on cars from the 1920s until the 1950s, which was granted US Patent 1286403 in 1918) and then, 1920-1922, to what we would now term the "after-market": a steering lock, patent 1347871, and carburetor heater, patent 1413681, which could be retro-fitted to other makers' cars. Family lore has it that one of the Piggins cars, loaded with spare tires (perhaps an unusual type that was difficult to buy along the way), was taken on an adventurous trip from Wisconsin to California and back by the two retired businessmen.